This week we are being sponsored by Glitterbabe. The DT were given images to play with this week. I am using Mistletoe on my card. What a beautiful card, just the kind I so love. Your design layout is simple but so elegant. I love the icy bue and white colour combination, and your perfect central image. Thank you so much for joining in our last challange of 2010. What a beautiful card. Love the simplicity of the design and your lovely gingham ribbon but my favourite bit is the blue sparkly borders - just gorgeous. Thank you for sharing with us at Bah! Humbug! Thanks for the lovely additions you've added to our challenge this week at Paper Cutz. Very pretty card... love the image and the sparkly blue is gorgeous. 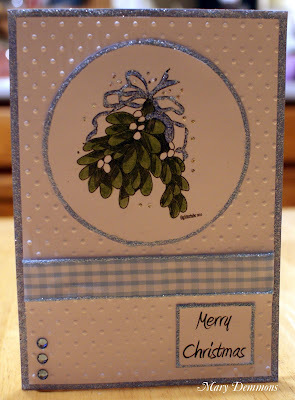 Thanks for joining our 'Untraditional Christmas' challenge at Totally Papercrafts this week.